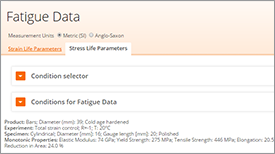 Some more recent concepts such as the statistical nature of fatigue, cyclic stress-strain curve and low-cycle fatigue are described in this article. Low cycle fatigue is increasingly important in the design of nuclear pressure vessels, steam turbines, and most of other types of power machinery. 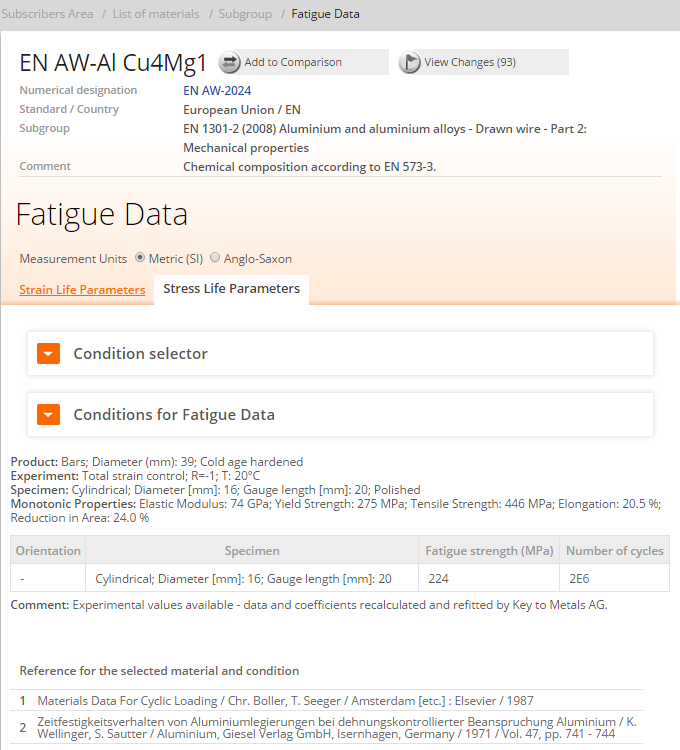 Fatigue strength is determined by applying different levels of cyclic stress to individual test specimens and measuring the number of cycles to failure. Standard laboratory test use various methods for applying the cyclic load, e.g. rotating bend, cantilever bend, axial push-pull and torsion. The data are plotted in the form of a stress-number of cycles to failure (S-N) curve. 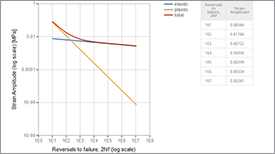 S-N test data are usually displayed on a log-log plot, with the actual S-N line representing the mean of the data from several tests. Owing to the statistical nature of the failure, several specimens have to be tested at each stress level. Some materials, notably low-carbon steels, exhibit a flattening off at a particular stress level as at (a) in Figure 1 which is referred to as the fatigue limit. As a rough guide, the fatigue limit is usually about 40% of the tensile strength. In principle, components designed so that the applied stresses do not exceed this level should not fail in service. The difficulty is a localized stress concentration may be present or introduced during service which leads to initiation, despite the design stress being normally below the 'safe' limit. 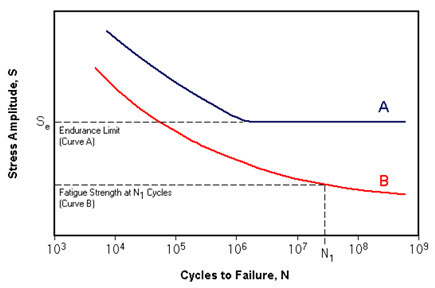 Most materials, however, exhibit a continually falling curve as in (b) and the usual indicator of fatigue strength is to quote the stress below which failure will not be expected in less than a given number of cycles which is referred to as the endurance limit. 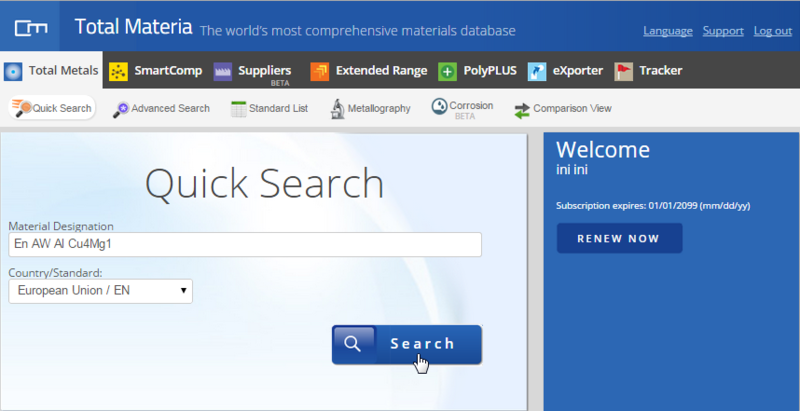 Certain materials have a fatigue limit or endurance limit which represents a stress level below which the material does not fail and can be cycled infinitely. If the applied stress level is below the endurance limit of the material, the structure is said to have an infinite life. This is characteristic of steel and titanium in benign environmental conditions. A typical S-N curve corresponding to this type of material is shown Curve A in Figure 1. 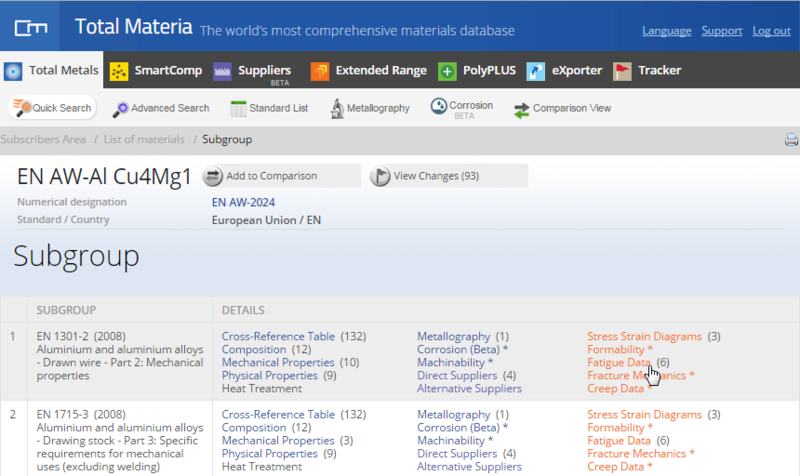 Many non-ferrous metals and alloys, such as aluminum, magnesium, and copper alloys, do not exhibit well-defined endurance limits. These materials instead display a continuously decreasing S-N response, similar to Curve B in Figure 1. In such cases a fatigue strength Sf for a given number of cycles must be specified. An effective endurance limit for these materials is sometimes defined as the stress that causes failure at 1x108 or 5x108 loading cycles. It is important to remember that the Endurance Limit of a material is not an absolute or fully repeatable number. In fact, several apparently identical samples, cut from adjacent sections in one bar of steel, will produce different EL values (as well as different UTS and YS) when tested, as illustrated by the S-N diagram below. Each of those three properties (UTS, YS, EL) is determined statistically, calculated from the (varying) results of a large number of apparently identical tests done on a population of apparently identical samples. Test results are sensitive to test method and the surface finish of the test piece. Test results can show 'scatter' due to their complex nature of fatigue failure mechanisms. 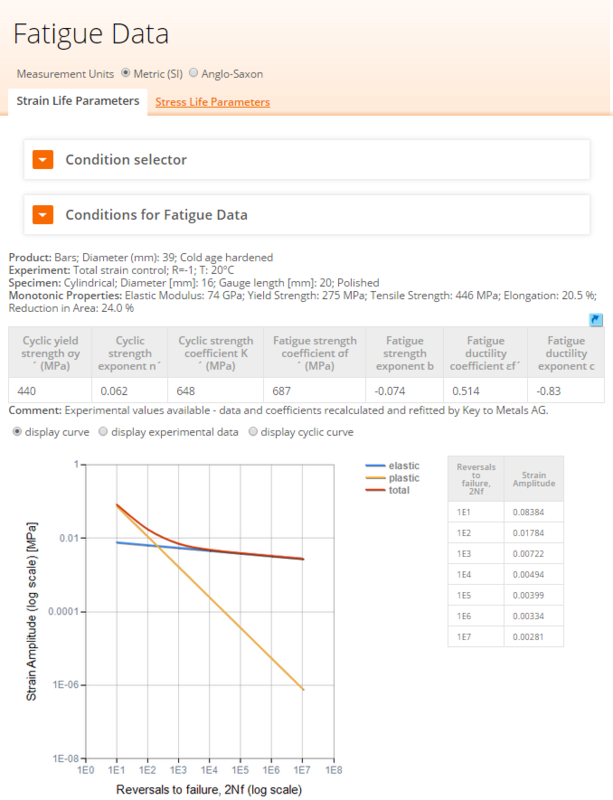 However, results published by Avesta researchers conclude that as a general rule austenitic and duplex stainless steels stainless have fatigue limits in air around their tensile 0.2% proof strength levels. They also note that the fatigue strength is also dependent on stress fluctuation frequency. Lower fatigue strength values occur as frequency increases. A more conservative conclusion from Alan Haynes (NiDI) is that duplex types have fatigue limits around 50% of their tensile strength, Rm (UTS). The INCO data published by NiDI (publication No 2978) supports the Avesta conclusion. This data shows endurance limits from reverse bending fatigue tests shown in the table. These values have been converted from psi to MPa and rounded to the nearest 5 MPa. 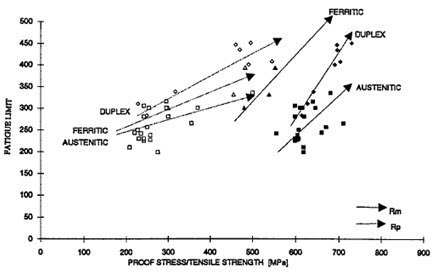 The fatigue strength, defined by the fatigue limit So (stress amplitude) in Wöhler curves at the life of 106 – 107 load cycles can be related to the tensile strength (Rm) as shown in Table 2 and Figure 2. The fatigue limit, So has also been related to the yield strength (Rp), in Figure 2. 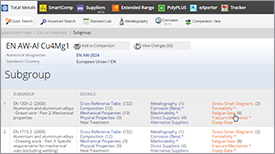 The fatigue ratio So/Rp exhibits a substantial variation with strength but the So/Rm ratio is almost independent of strength within each steel type. 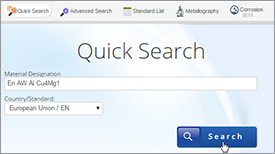 The lower values of fatigue ratio for the austenitic steels compared to the duplex is a consequence of the low yield to tensile strength ratio for the austenitics. The effect of stress ratio, R = Smin/Smax, is as expected, reflecting only that the fatigue limit decreases with increasing mean load.